❉ Alun Harris looks back on the fondly remembered anthology series, which recently enjoyed a repeat run on Sky Arts. Although Roald Dahl is best remembered now for his children’s fiction, in the early part of his career he was a very successful writer of short stories with a sinister twist. During the 1950s a number of American television series offered adaptations of these stories (one story, Taste, being produced by three different networks in the space of two years). As one of the most widely recognised directors in the world, it is no surprise that Alfred Hitchcock Presents is perhaps the best-remembered anthology series television has ever produced, and six Roald Dahl stories were introduced by the Master of Suspense – one of them, Lamb to the Slaughter, directed by Hitchcock himself and winning several awards. The UK’s commercial channel, ITV, began broadcasting Roald Dahl’s Tales of the Unexpected in early 1979, following an unplanned meeting between Dahl and Sir John Woolf, a drama producer, in 1976. It was Dahl who pitched the idea of the series and Woolf was very interested by the idea. Dahl’s stories were perfect for an anthology series: they were short, they could be easily adapted to the 25 minute format, and they all featured a twist at the end. Dahl introduced each story on camera with a short, witty monologue and the highly memorable theme tune for the series was written by Ron Grainer, a great among TV theme tune composers (he also wrote the music for The Prisoner and Doctor Who). Budgets for the series were tight, with the money usually spent on the memorable guest casts, a splendid mix of either beloved British character actors or internationally famous stars. Over the nine seasons the series ran, such names as John Mills, Elaine Stritch, Joan Collins, Joseph Cotton, Michael Gambon, Julian Fellowes, John Gielgud, Denholm Elliott, Eli Wallach, Anthony Quayle, Telly Savalas, Elaine Paige, Leslie Caron, Derek Jacobi, Ian Holm, Peter Barkworth, Terry O’Quinn, Victoria Tennant, Peter Cushing, Brenda Blethyn, Sharon Gless, George Peppard, Brad Dourif, Ed Begley Jr, Gloria Grahame, Sondra Locke, Janet Leigh, Don Johnson, Charles Dance, Pauline Collins, Jim Broadbent and Topol appeared. On paper this sounds ridiculous, but the episode goes out of its way to avoid any silliness – we never see the baby after the transformation begins (which is definitely the most successful way to present such an outrageous idea – the audience have no idea what it looks like, so fill in the blanks themselves, resulting in a far more terrifying image than the programme could have managed) and the horror of the concept is conveyed mostly by Timothy West’s incredibly intense performance and the strange buzzes he adds to his dialogue. The result is one of the most memorable episodes of the whole series. A mix of other writers were introduced to the series from the second season onwards and the Roald Dahl’s part of the title was dropped to become simply Tales of the Unexpected (Dahl’s on-screen introductions ceased from the fourth season). Although the vast majority of episodes could best be described as thrillers or mysteries (in later seasons there are even some comedies or stories of a more whimsical nature), a number did move into outright horror territory. The remainder of the episodes from the series never stray into the horror genre, although some of the episodes dealing with serial killers come close (in one episode, a detective hunting for a murderer kills his own mistress in order for it to appear that the serial killer did it. This is only revealed at the end, of course), but all of them have their merits, and the series (still shown today) has gone on to become firmly embedded in the UK’s subconscious, images from some of the episodes staying with people to this very day, references to the stories being made whenever something peculiar happens. 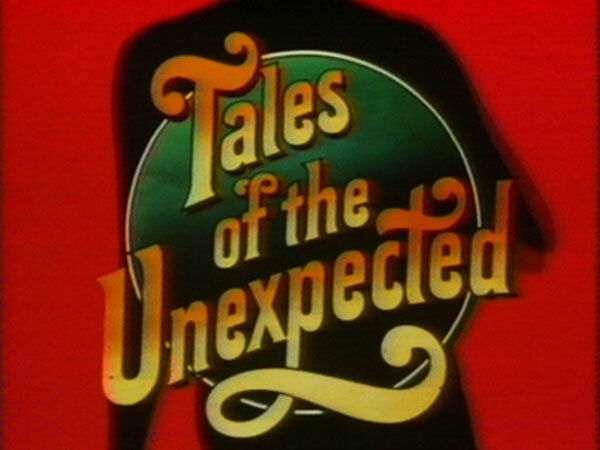 If a mark of success can be said to be the recognition a series has received, then Tales of the Unexpected was very successful indeed. This was a superb series and frequently gave me nightmares as a kid. The episode ‘Flypaper’ was particularly sinister. Reading this has put me in the mood for getting the box set out later tonight ! The one where a mad landlady kills and stuffs her luckless lodgers gave me many nightmares as a callow youth. Lamb to the Slaughter where the police unwittingly eat the murder weapon was always a favorite of mine.